In this blog post, I present stiffness and mass matrix as well as eigenvalues and eigenvectors of the Laplace operator (Laplacian) on domains , , and so on (hyperrectangles) with zero Dirichlet boundary conditions discretized with the finite difference method (FDM) and the finite element method (FEM) on equidistant grids. For the FDM discretization, we use the central differences scheme with the standard five-point stencil in 2D. For the FEM, the ansatz functions are the hat functions. The matrices, standard eigenvalue problems , and generalized eigenvalue problems arising from the discretization lend themselves for test problems in numerical linear algebra because they are well-conditioned, not diagonal, and the matrix dimension can be increased arbitrarily. Python code generating the matrices and their eigenpairs can be found in my git repository discrete-laplacian. The combination of Laplace operator and the finite difference method (FDM) can be very well used in an introductory course on the numerical treatment of partial differential equations (PDEs) for the illustration of concepts such as discretization of PDEs, discretization error, the growth of the matrix condition number with finer grids, and sparse solvers. In numerical linear algebra, the Laplace operator is appealing because the FDM discretization of the operator on a one-dimensional domain yields a standard eigenvalue problem with a sparse, real symmetric positive-definite, tridiagonal Toeplitz matrix and known eigenpairs. For domains in higher dimensions, the matrices can be constructed with the aid of the Kronecker sum and consequently, the eigenpairs can be calculated in this case, too. With this knowledge, the Laplace operator makes for a good, easy test problem in numerical mathematics because we can distinguish between discretization errors and algebraic solution errors. Naturally, the Laplace operator can also be discretized with the finite element method (FEM) yielding a generalized eigenvalue problem with sparse, real symmetric positive-definite matrices. Here, the eigenpairs are known, too, and furthermore, the eigenvectors are exact in the grid points (so-called superconvergence) providing us with another well-conditioned test problem. I will present the solutions for the continuous case before I briefly introduce Kronecker products and Kronecker sums since these linear algebra operations are used to construct the matrices corresponding to higher dimensional domains. Finally, I discuss domain discretization and notation before giving closed expressions for the matrices and their eigenpairs created by FDM and FEM. In the end, there is an example demonstrating the use of the quantities , , and . These solutions can be found, e.g., in the book Methods of Mathematical Physics, Vol. I, Chapter VI, §4.1. The Kronecker sum occurs during the construction of the 2D FDM matrix. See, e.g., Matrix Analysis for Scientists and Engineers by Alan J. Laub, Chapter 13, for more information on these operations. For the 1D case along the -th axis, we use points uniformly distributed over , such that the step size is . We use lexicographical ordering of points, e.g., in 2D let be an eigenfunction of the continuous problem, let be an eigenvector of the algebraic eigenvalue problem. Then is an approximation to , approximates , approximates , and so on. To obtain accurate approximations to the solutions of the continuous eigenvalue problem, the distance between adjacent grid points should always be constant. Thus, if the length of the 1D domain is doubled, the number of grid points should be doubled, too. In the following sections, we need to deal with matrices arising from discretizations of the Laplace operator on 1D domains with different step sizes and their eigenpairs as well as discretizations of the Laplace operator on higher dimensional domains and their eigenpairs. denotes the identity matrix; its dimension can be gathered from the context. Matrices denote the Laplacian discretized with the FDM, matrices denote the discrete Laplacian on 1D domains along the -th axis, and matrices denote the the discrete Laplacian on a -dimensional domain. The eigenpairs of are signified by , , are the eigenpairs of . Similarly, and are the stiffness and mass matrix, respectively, of the Laplace operator discretized with the finite element method. denote the discrete Laplacian on a one-dimensional domain along the -th axis, and , are the stiffness and mass matrix for the discrete Laplacian on a -dimensional hyperrectangle. We speak of the solutions of or of eigenpairs of the matrix pencil . The eigenpairs of are denoted by , whereas signify eigenpairs of . In this section, we will construct the matrices of the discretized Laplace operator on a -dimensional domain with the aid of the matrices for the -dimensional and the one-dimensional case. Similarly to the finite differences method, we can construct the matrices of the discretized equation recursively. We use hat functions as ansatz functions throughout this section. Now I will present the matrices of the discrete Laplacian on the domain . 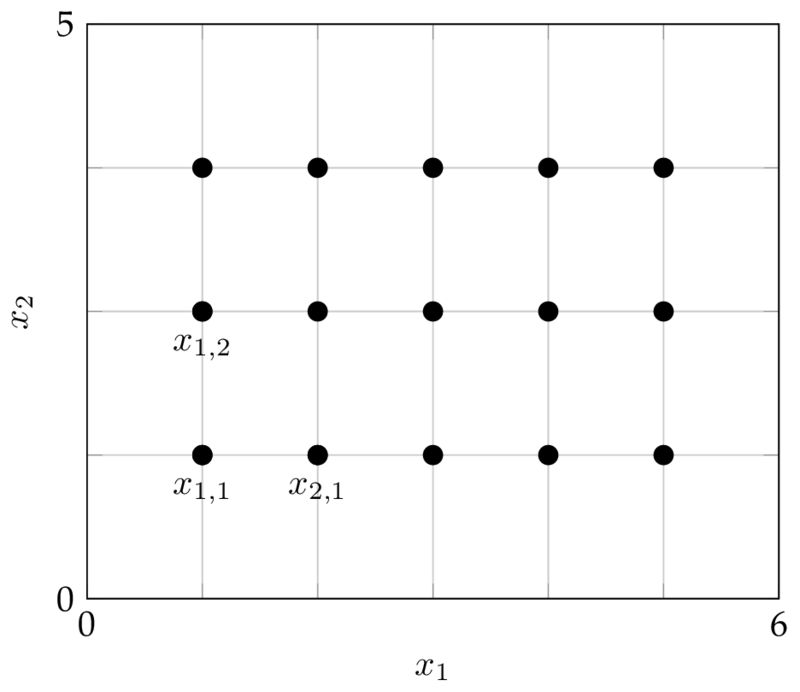 The figure below shows the domain and the grid used for discretization: there are five interior grid points along the first axis, three interior points along the second axis, and the interior grid points are highlighted as black circles. Thus, , , , , the step size , and . In 2D, an eigenvector of the algebraic eigenvalue problem will possess entries , , such that , , , , , , because of the lexicographic ordering.